The VALEUR MAGAZINE THE LAST JEDI Special Edition is dedicated to a saga, that fascinates million people all over the world for 40 years. Episode VIII stands for 4 decades of phantasy, dreams, friendships, enthusiasm, and many values which make our life worth living. PLEASE USE THE WHITE SQUARE ABOVE RIGHT TO READ THE ISSUE IN FULL-SCREEN MODE. HAVE FUN WITH THE VALEUR MAGAZINE STAR WARS THE LAST JEDI SPECIAL EDITION. Daisy Ridley, Mark Hamill, and many other stars attended the Premieres of Star Wars: The Last Jedi this week. Even, the HRH Duke of Cambridge and HRH Prince Harry attended the event in UK. It took place at the Royal Albert Hall in London on Tuesday 12th December 2017. The world premiere was celebrated at The Shrine Auditorium in Los Angeles, USA on December 9, 2017. This issue is also dedicated to a very brave and special woman: Carrie Fisher. Due to her role as Princess Leia, she was and will always be a significant part of the most amazing universe that we have had the luck to discover. She will be in our hearts forever. Moreover, Carrie Fisher will be immortal because of her unique character. Her work and life will forever be treasured. Furthermore, the VALEUR MAGAZINE STAR WARS THE LAST JEDI Anniversary Edition presents an insight into the world’s biggest costume fan club, the 501st Legion. Also, this year, they supported the STAR WARS CELEBRATION. Here, thousands of fans came together. They talked about their favorite films and shared experiences. Of course, they found also new pieces for their personal STAR WARS collection. VALEUR shows interviews with the stars of the STAR WARS universe. Read and watch what Harrison Ford, George Lucas, Daisy Ridley have to tell about their experiences. Star Wars: The Last Jedi. Rey (Daisy Ridley). Photo: Lucasfilm Ltd. © 2017 Lucasfilm Ltd. All Rights Reserved. For millions of people it will be the best Christmas present this year. Without any doubt, Star Wars The Last Jedi is in touch with the force and another milestone within the galaxy far, far away. Atmospherically, the sequel starts where The Force Awakens ended. But, moreover, it broadens the story to a next higher level. Again, Star Wars The Last Jedi presents a sentimental, naïve, optimistic and melancholic story and it’s fine. It’s about winning and losing, success and failure, heroism and egoism, hate and love. The heroes are fallible, which is what makes them authentic and very likable. Besides, villains don’t just fight against the Resistance, but against their inner conflicts and own weaknesses. These traits bring them much closer to us. Star Wars: The Last Jedi. Luke Skywalker (Mark Hamill). Photo: Lucasfilm Ltd. © 2017 Lucasfilm Ltd. All Rights Reserved. WHO’S GOOD, WHO IS REALLY BAD? The borders between good and evil become blurred. The heroes ask themselves the same questions as the audience does. How can a small group of idealists and a Jedi repel the superiority of the First Order? Furthermore, who is the last Jedi? Star Wars The Last Jedi is brimming with emotions, adventurous action and a terrific sense of humour. With a smart use of pun and through delicate gestures, Rian Johnson fascinates the audience and makes them laugh at the same time. Star Wars: The Last Jedi. 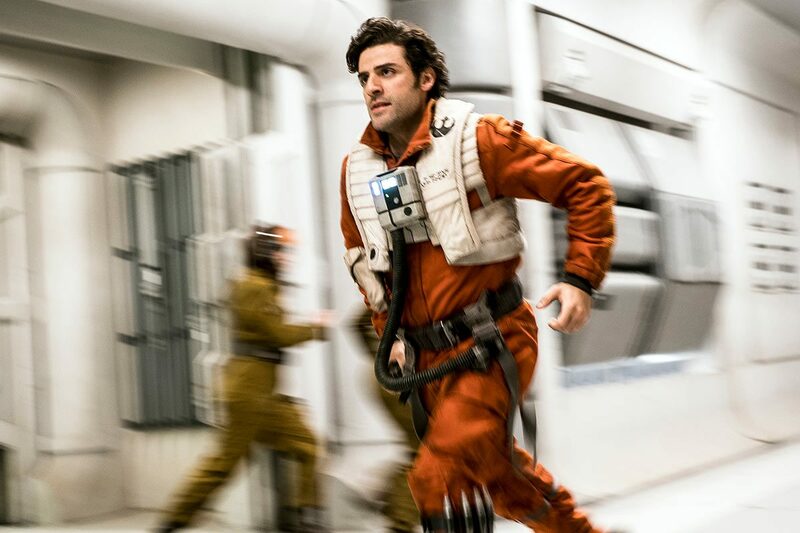 Poe Dameron (Oscar Isaac). Photo: David James. ©2017 Lucasfilm Ltd. All Rights Reserved. Of course, some fans might miss the abyssal dark side. But The Last Jedi is a part of a huge entertainment universe. It’s the perfect movie for all generations, from the young to the old. And so, also older fans have to accept that merchandising plays an important role today. This makes it possible to bring those blockbusters to the big screens. Thus, when it’s included in a coherent way, it’s also easy to accept while watching the film. Star Wars: The Last Jedi. Kylo Ren (Adam Driver). Photo: Lucasfilm Ltd. © 2017 Lucasfilm Ltd. All Rights Reserved. The Last Jedi opens the doors to the next generation of Star Wars fans. It convinces with a smart coherent storyline filled with emotions, amazing action scenes and breathtaking visuals. Even if it’s a bit cliché sometimes, the characters as well as the unique sense of humor, reminds us of the original trilogy. Therefore, The Last Jedi is a worthy successor and the perfect movie to enjoy over Christmas with the complete family in a cinema in the neighborhood. Star Wars: The Last Jedi. L to R: Finn (John Boyega) battling Captain Phasma (Gwendoline Christie). Photo: Lucasfilm Ltd. ..© 2017 Lucasfilm Ltd. All Rights Reserved. Pictures: Copyright: 2016 Lucasfilm Ltd. & TM, All Rights Reserved. You love to write and to create profound stories to show people interesting things, that affect our every day life? Then visit our job area and contact us. You have a unique personality and look and you love to act onstage and in front of the camera? Your dance skills are above average, you are musician or any other true talent? Then, contact us to become a VALEUR MODEL. You are a strong communicator and organisational talent? You love people and you can handle stress and chaos well? Then, become a member of our booking department soon. You love to capture special moments? You want to learn more about the complexity of photo & video productions. Then, find more information in our job area. You recognize trends? You are or want to become an expert in the modern ways of communication? Then check our vacancies in this field.